This majority of this forum is currently private. 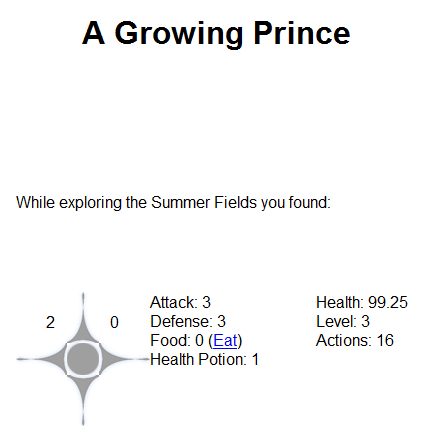 For Ludum Dare 34 I created a small game called A Growing Prince. The game itself was largely incomplete and lacked a lot of expected features. I then preceded to finish/create a game that was functionally complete. This is a small part of a larger project that I will go into more depth about at a later time. Below is a Screen Shot, the game is not much to look at, but that is the roll of a text based adventure game. You can play the game right now, right here. You can also read a bit more about the technical side of this game over on the Blog.